The Evangelical Right did not come together in response to the Roe v. Wade decision but in response to the attempt by the IRS to rescind the tax-exempt status of private schools because of the school’s racially discriminatory policies. The Government’s fundamental, overriding interest in eradicating racial discrimination in education substantially outweighs whatever burden denial of tax benefits places on petitioners’ exercise of their religious beliefs. Paul M. Weyrich, a longtime conservative activist, and one of the architects of the Religious Right in the late 1970s, insisted that the political movement got its start when the IRS tried to rescind the tax-exempt status of schools that practiced racial discrimination. Weyrich tried for years to energize evangelical voters over issues such as school prayer, abortion, and the proposed equal rights amendment. Weyrich added: “What changed their mind was Jimmy Carter’s intervention against the Christian schools, trying to deny them tax-exempt status on the basis of so-called de facto segregation.” The 1972 Green decision and the 1975 IRS action against Bob Jones University actually predate Jimmy Carter’s presidency (1977-1981). Discrimination based on race makes absolutely no sense based on genetics alone. Dr. Spencer Wells has traced The Journey of Man through evidence uncovered in the Y-chromosome. 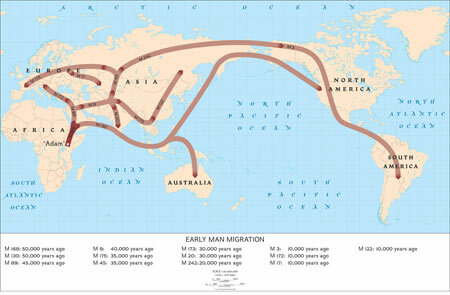 This evidence shows that evangelicals, and everyone else, are descended from Africans. Oh the irony! White evangelicals can trace their ancestry back to black Africans. Maybe that’s the real reason they deny evolution. H/T: Randall Balmer, Jonathan Dudley, Bob Allen, Ed Kilgore. It’s great fun to kid you boyo … you’re a good sport. The way I see it, is that David presented a concept and backed it up with some citations. I agree with his premises and it seems you disagree with them, which is not only your right, but what in effect makes Jonathan Turley’s blog work. It is a forum for discussion and not necessarily one of research. The better the level of discussion, the more enjoyable I think it is for most of us. David is more than capable of defending his work so I would like to deal with another aspect that goes to the heart of your critique and perhaps a misconception that you have about what goes on here. To do that I must talk about myself, explaining my process writing here and how/what I’m trying to accomplish. I’m a voracious reader and have been since the age of seven. In my youth and up until perhaps the age of 60 I was also blessed with being a natural speed reader. Typically, since that young age I’ve probably average more than 200 hundred books read per year on a great variety of topics and a great variety of genres. In the non-fiction realm my primary interests have been history, the study of mythology, comparative religion and politics. Even in the fiction realm though, much of my reading has been informative about the world around me. For instance, Norman Mailer’s book “Harlot’s Ghost”, while fiction I believes captures the essence of the CIA mindset better than anything yet written. Whether it is true, or not, I think I also spend more time pondering what I see as the great issues than most people, would bother. I’ve been blessed/cursed with an overactive mind to the point where I often find it hard to sleep. My years in therapy and in psychotherapy training, have given me techniques to turn off my mind, so I went from an average of 4 hours sleep per night to a healthier seven hours. With the ideas “churning” in my consciousness through the years I’ve synthesized all that I know (or think I know 🙂 ) into sort of a unified theory of how this world and particularly the U.S. works. For years I’ve pondered whether to write a tome expressing my viewpoint, but to do it would require massive research. The problem is that its themes would have to be both psychological, mythological and historical. While I was working I frankly didn’t have the energy to attempt this undertaking. My early retirement was due to disability and an ever worsening heart condition culminating more than two years ago into near death and the miraculously a heart transplant. My mental faculties have suffered somewhat in this process, as has my memory. Therefore I “know” certain things, but their source is often unclear. You’ve no doubt noticed that almost all my guest blogs have at base a commonality. The thread that attaches them all is that the US is, or is in danger of becoming a feudal state. This has been accomplished in my opinion by the use of corporate inspired propaganda creating a “mythology” that keeps many people from seeing the true nature of what the US and humanity is becoming. When I write a guest blog it typically begins as a part of this conception that I have, but for honesty’s sake I feel compelled to add some research to bolster my concept. If you look at the four guest blogs I’ve written in the last two weeks, you will see that I only touched the surface in research, even though I’m confident in my sources. I leave it to those who comment to add to and expand my thesis if they agree ad to critique it when they disagree. Luckily we have a wide range of intelligent, informed people here who take the ball and run with it in their comments. So all this is my rather long-winded explanation of what goes into my work. While many of the other guest bloggers are even smarter and more knowledgeable than I, with the exception of Elaine, they are still working and so while our process may be different, they also are limited in their ability to research a topic. As far as the issue of religion goes, I believe that it is quite apt for discussion here. 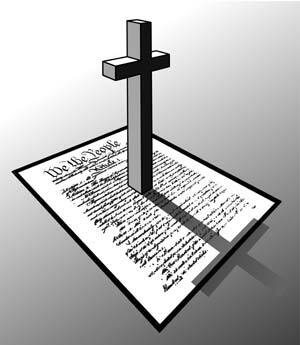 The influence of organized religion on the political workings of the US has been going on since our Country’s founding and indeed this blog’s proprietor has done may, many blogs on religion’s influence upon our political process and on fair treatment of people. Now many who write here are either atheists, or agnostics and because of that they view religion in a certain way. I’m a Deist though, who practices Jewish Ritual because my emotions are imbued with feelings of being a Jew. Yet, I do believe that organized religion tends towards matters of power, rather than salvation. I think that separating the ineffable, from the prosaic will to power is important and those institutions that are more concerned with that power should be exposed. I’ve taken this time to try to explain to you what goes into creating a guest blog, to perhaps inform. Mainly though, you have been in your time here a quite thoughtful commenter and because of that your participation should be encouraged. Were this a forum of people who all agree on everything it would be a bore. Thankfully it isn’t and your help is appreciated.